Rich in national parks, the large but thinly populated Guanacaste province in northwest Costa Rica is known for its surfing and abundant wildlife, including more than 800 species of birds. Some 99 miles of beach line the country's Pacific shore. To the east stretches a mix of grassy savannahs, large cattle ranches, tropical dry forests, and a backdrop of volcanic mountain ranges. Within that sweep are cloud forests, active volcanoes, several national parks, wildlife refuges, coffee plantations, hot springs, and more. This Four Seasons is strategically situated to explore the region, sprawling as it does across a narrow peninsula that juts into the Gulf of Papagayo. There are beaches on both sides, and the ebb and flow of the waves bathes the Handsomely constructed using lava, stone, and native woods, the resort is the centerpiece of a 2,300-acre master-planned community. Its 155 rooms and suites begin along the beach—one of two—and climb into the wooded hills. All afford ready access to a a broad selection of amenities—including three swimming pools, a spa and fitness center, watersports, an Arnold Palmer-designed 18-hole golf course, five tennis courts (one of them grass), a children's program, a teen center, and a handful of restaurants and lounges. 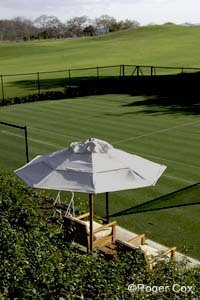 In 2011, the resort focused attention on its tennis by adding a grass court to the four Har-Tru already in place. Peter Burwash International's JF Robitaille currently oversees the operation. Born in Trois Rivieres in Quebec, Canada, he reached the Top 25 as a junior before going on to play for Stony Brook University, a Division I school. He then joined PBI in 2008 and was posted first to Madinat Jumeirah in Dubai before moving on to position in Lebanon, Southampton (NY), and Singapore, before coming to Costa Rica. Tennis Programs. During the week, the roster includes some sort of organized tennis activity: complimentary drop-in singles and doubles, Cardio tennis, drills and strategy clinics, and a weekly Kids Carnival of 10 and Under tennis, the last a module in the Kids for All Seasons program. Courts & Fees. There are four Har-Tru (clay) courts and one natural grass court. Court fees: $50/hour on grass, $35/hour on Har-Tru. Golf Courses. Arnold Palmer designed the 18-hole Four Season Golf Club, a 6,800-yard, par 72 course laid out up and down the hills of the Papagayo Peninsula. And ... Birdwatching, hiking, snorkeling, and sailing. Kids for All Seasons offers complimentary supervised programs for kids age 4 to 12, while teens can look forward to their own teen center and concierge. There are essentially three accommodation options: 600-square-foot hotel rooms with terraces in the four-story buildings behind the beach; canopy suites, ranging in size from one to three bedrooms and located in the wooded hills with views of the jungle canopy; and one-to-three-bedroom privately owned residential estates. Rates vary seasonally, and a generally highest in winter, lowest in summer. See the website for specifics for the period you intend to travel. Travel Instructions. The closest air gateway is Daniel Oduber International Airport (LIR) in Liberia, Costa Rica, 23 miles to the east. It is served by Air Canada, American, Delta, Jetblue, and United from various locations in the U.S. and Canada as well as selected carriers from Europe, Latin America, and Asia. General Tourist Information. Information about vacationing in Costa Rica is available from the Institute of Costa Rican Tourism's website or toll-free from the U.S. and Canada at 866-COSTA RICA.